This February, Kragujevac, a city in central Serbia, marked a hundred years since the death of Dr Elizabeth Ross and other members of the British medical missions who lost their lives while aiding the Serbian people in the Great War. The annual ceremony was attended by the ambassadors of the United Kingdom, Canada and Australia, numerous dignitaries and local people. After a Christian Orthodox service the memorial plaque was unveiled by the Mayor of Kragujevac and President of the Red Cross of Serbia. British Ambassador to Serbia Denis Keefe said he greatly appreciated the fact that the remembrance of the doctors and nurses had been preserved and thanked Kragujevac for keeping the memory of Dr. Elizabeth Ross alive. Sir Paul Judge, the Chairman, was present on behalf of the British-Serbian Chamber of Commerce. Undeterred, they offered their services to the French and Belgian Red Cross who were only too happy to accept and this is how one of their first overseas hospitals was set up in Royamont, in France. Further missions were established and the “First Serbian Unit” was assigned to Kragujevac in January 2015. Amongst them was Dr. Elizabeth Ross (36), from Tain in the Scottish Highlands. Known as “Tibbie” to her friends, Dr. Ross had a delicate physique that stood in stark contrast to her steely determination to work as and where she wanted. On arrival she agreed to take charge of the Typhus ward in the First Reserve Hospital. In the same hospital, there was already an Anglo-American unit which was formed by Mabel Grujic (41), the American wife of Serbian Under-Secretary for Foreign Affairs, Slavko Grujic. During her stay In London, Mabel Grujic was determined to form a medical team and travel to Serbia under the auspices of the Serbian Red Cross. On 12th August 1914, a mere eight days after the war had been declared between Britain and Germany, a group of nurses gathered on the platform at Charring Cross Station: Miss Flora Sandes, Miss Emily Simmonds, Mrs. Ada Barlow, Miss Violet O’Brien, Miss Ada Mann, Mrs. Rebeca Hartney, Mrs. Barber and Miss Grace Symonds. After 14 days of arduous journey via France, Italy and Greece, they arrived at Kragujevac railway station, a town sixty miles south of Belgrade that was rapidly becoming a main hospital center by virtue of its position astride transportation routes. A very important role at that time played the Serbian Relief Fund created in the UK for medical assistance to Serbia. Queen Mary was the Patroness of the Serbian Relief Fund and board members were prominent politicians and persons of the time, Lloyd George, Winston Churchill, Cardinal Born, et al. The first unit of the Serbian Relief Fund – the hospital with 600 beds, arrived in Serbia in mid- November 1914 and was located in the vicinity of Skoplje, today the capital of the Former Yugoslav Republic of Macedonia. At its head there was a lady, Leila Paget, the wife of an English diplomat in Serbia, Sir Ralph Paget, who was appointed chief of all British units for assistance in Serbia. Running a hospital was not a new experience. Ralph Paget was posted to Serbia in 1910 and very soon Leila Paget set up military hospital in Belgrade running it throughout both Balkan wars. Lady Paget’s association with Serbian people carried on throughout her life. When Axis Powers invaded the Kingdom of Yugoslavia in 1941 she offered her help again. She corresponded with Dr Milan Gavrilovic, the Minister for Justice of the Government-in-exile, got acquainted with Dr Slobodan Jovanovic, Prime Minister of the Government in exile, and helped the poet and novelist Milos Crnjanski to obtain British citizenship. Warren House in Kingston-upon-Thames, the magnificent family seat since 1907 was transformed in 1942 into a military convalescence home. She was a donor to the Serbian Church of St. Sava in London where in 1958 when she died, a service was held attended by Queen Marija of Yugoslavia and Prince Tomislav. Mabel Grujic led the first volunteer medical unit from British shores to Serbia, returned to New York to raise more funds and in the summer of 1915 sent a second unit to Serbia to open Grujic Baby Hospital in Nis. In autumn of 1915 she turned the hospital into a frontline field ambulance. In March 1937, her husband Slavko Grujic (68), the then Yugoslav Ambassador died in London of heart failure. His funeral brought together almost all surviving British women that helped Serbia. After the war, Mabel opened an orphanage the American Home for Yugoslav Children in the warm environment of Selce on the Dalmatian coast. Lady Louise Margaret Leila Wemyss Paget GBE (1881-1958). She ran the “Sixth Reserve Hospital / Mission Lady Paget” in Skopje. A long-life supporter of Serbia and Serbs Lady Paget died in company of Marie Kovacevic, a loyal and devoted member of staff, saying: “May all forget me, I do not care. But it will be hard on me if my Serbs forget me”. Dr Elizabeth Ross; Died from typhus in Kragujevac 14th February 1915, age 37. Dr Katherine MacPhail; graduated in medicine from Glasgow University; street named after her in Sremska Kamenica. Her last visit to Serbia was in 1954 when she was invited to celebrate the twentieth anniversary of the opening of her Anglo-Yugoslav Hospital in Kamenica. In 1973 at the age of 86 she was elected an honorary member of the Serbian Medical Association. She died on 21st September 1974 missing by few hours a letter from the Yugoslav ambassador in London letting her know that her name had been put forward to receive the Order of the Yugoslav Flag with Gold Star in honour of her work. Her hospital remained open as an orthopaedic ward of the Novi Sad School of Medicine until 1992, now sadly abandoned. But attempts are being made to raise sufficient funds for the renovation of the “English Hospital” as a memorial to her work. Flora Sandes; first aid helper and Red Cross volunteer, the only Western woman to enlist as a soldier in the First World War. In November 1916 in a desperate situation she commanded the charge against prevailing German and Bulgarian forces on Hill 1212 near Monastir in Serbian held Macedonia: “Drugi vod napred!” (“Second Platoon forward!). Wounded, she was awarded gold and silver Karadjordje Star with Swords with automatic promotion to sergeant major, and later promoted to Second Lieutenant. She spent her life travelling and seeking new adventures. In 1954 she accepted an invitation from the Salonika Reunion Association and visited Belgrade for the last time. She died at the age of 80 after a brief and sudden illness at Ipswich and East Suffolk Hospital on 24th November 1956. In 2009, a street in Belgrade was named after her. Milunka Savic; the twenty-eight-years old woman soldier with whom Flora Sands shared a tent at the 41st General Hospital. Later sent to Bizerte and France where she was awarded the Legion d’Honneur and Allied medals. She remains the most decorated woman in history. Died 5th October 1973. There is a Milunka Savic street in Belgrade. Dr Elsie Inglis; Memorial Fountain in Mladenovac, died in Edinburgh and her pall-bearers were Serbian officers. Dr Isabel Emslie Hutton; Secondary Medical School in Vranje. Mabel St Clair Stobart; Born in Dorset. Arrived in Kragujevac in April 1915 with forty-five mainly female staff to set up the third hospital of the Serbian Relief Fund entirely under canvas. Stobart Dispensary in nearby Vitanovac followed soon. Emily Simmonds; nursed the wounded in Kragujevac, survived typhus in Valjevo, rescued refugees in Albania and Serbian boys in Corfu, fought cholera on refugee ships, cared for children in Brod and refugees in Vodena (Edessa), set up soldiers canteens in Macedonia and Belgrade. Returned to USA in 1921 and joined the Quaker movement. Died forgotten from pneumonia in Los Angeles hospital on 18th February 1966. In 2006 with the help of American Red Cross a small stone memorial was erected and Serbian Orthodox service was held in her honour. Ada Barlow; nurse, returned to England with the Paget Unit following their release from captivity in 1916. Afterwards, went to Corsica to work with Serbian refugees there. By the end of the war she lived in Manchester where she ran the Lord Mayor of Manchester fund in aid of Serbia. Cornelia Lady Wimborne; the second hospital of Serbian Relief Fund was Lady Wimborne Hospital, Skopje. Margaret “Madge” Neill Fraser; Scottish and British golf champion, died from typhus in 1915 in Serbia. Evelina Haverfield; Scottish baroness, died from typhus in 1915, in Serbia. I was greatly assisted with this article by Ms. Zvezdana Popovic with her research and a set of splendid exhibitions earlier this year. I also acknowledge honestly stolen passages from Louise Miller’s book “Flora Sandes – The life of the Captain”; Vickie Good’s “The Warren House Tales” and Milan Radovanovic’s article “British Medical Missions in Serbia 1914-1915” in Philatelist June 2012. In memory of my grandfather Dr. Avram Valavanidis a surgeon (University of Constantinople and Vienna), who died in late 1914 from typhus while attending to Serbian soldiers in his private hospital in Monastir (Bitola). The family name later changed from Valavanidis to Balabanovic. 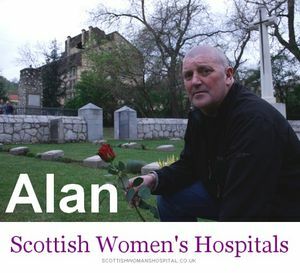 Depuis plusieurs années il mène des recherches, rédige des articles, produit des films, donne des conférences sur le Scottish Women’s Hospitals. Alan contribue ainsi à faire connaître l’histoire de ces femmes exceptionnelles qui ont sauvé des milliers de vies pendant la Première Guerre mondiale. Il est le créateur du sitehttp://scottishwomenshospitals.co.uk/ , le site de référence de l’histoire du SWH. Alan est un des partenaires de la Semaine du Centenaire de Chanteloup. Nous lui devons notamment des photos rares et précieuses que nous exposerons en juin prochain. We really appreciated you travelling such a distance to be with us on Friday. You gave us an excellent piece, and the film was fascinating and very well put together. Several people have commented on how moving they found it. Thanks again for coming to share your research with us. We wish you all the best with carrying on the story of the Scottish Women’s Hospitals. De Garis was a pioneering doctor in the early 20th century, one of the first women “medicals” to graduate from Melbourne University. From an established Mildura family, she practised in outback Australia before serving in World War One as a doctor in Macedonia. After the war she settled back in Australia, in Geelong where she was the city’s first female obstetrician. She provided safe childbirth before antibiotics and blood transfusions and generations of woman treasured her. She was a medical practitioner and obstetrician, also a campaigner, child welfare advocate and feminist. Her life and loves and the struggles she faced as a leader in her field are the subject of this fascinating biography. De Garis was born in Charleton, northern Victoria, Australia in 1881. Her father, Elisha De Garis, was a Methodist minister, and then an entrepreneur in irrigation, real estate and dried fruits in Mildura. Her mother, Elizabeth Buncle, was a bush nurse and midwife. De Garis and her twin sister were the oldest of six children. For her last years of schooling, to prepare for university, De Garis moved from country Victoria to attend Methodist Ladies College, in the Melbourne suburb of Kew. She was intellectually talented, and won the prize for the top student of the school in 1898. In 1900, De Garis began medical training at the University of Melbourne. De Garis helped form the Victorian Women’s Medical Students’ Society. She was the 31st woman to enroll in medicine at the University of Melbourne. With excellent results she became a Resident at the Melbourne Hospital in 1905-1906. In 1907, she became the second woman in Victoria to graduate with a Doctorate of Medicine. In 1907, she travelled to Muttaburra Hospital, Queensland, where she was the sole surgeon for 14 months. She went straight to the outback to work because it was the quickest way a female medical graduate could get experience. De Garis sailed to the UK, Europe and the USA and completed postgraduate courses. She attended suffrage rallies in London and heard the Pankhursts speak. It was a small desert settlement in outback Australia near the border with Queensland and South Australia. She met Colin Thomson, a farmer, and they became engaged in July 1914, just two weeks before Britain declared war on Germany. Colin enlisted and served in Egypt, Gallipoli and France. He died at Pozieres, France in August 1916. The policy in both the Australian and British Armies was to not accept female doctors. Feminists set up the Scottish Women’s Hospitals, 14 medical units staffed by women. The British army refused their support, so they supported the armies of Britain’s allies in Macedonia, Serbia, Corsica, France, Russia and Salonika. 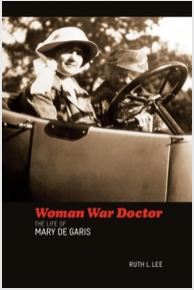 On the outbreak of World War I, De Garis offered her services to the Australian Army. They rejected her, so she travelled to London at her own expense and joined the Scottish Women’s Hospitals. She was both a patriot and a feminist. She worked in a 200 bed tent hospital in Ostrovo, northern Macedonia for 12 months in 1917-1918. She was fearless, operating on wounded soldiers while bombs were dropping. In winter it snowed. Malaria was endemic. Her leadership style was authoritarian and some staff criticised her for not being consultative. She wrote that she felt a heavy responsibility for her staff and did not need an advisory committee. The Serbian Government awarded her a medal. The British Government awarded her two service medals. The Australian government made no award. De Garis returned to Melbourne in February 1919. She was practising as Geelong’s first female medical practitioner by April 1919. De Garis lobbied for a maternity ward for seven years. The administrators didn’t see the need. Middle class women gave birth in private maternity hospitals while poor women called the midwife. When the maternity ward was commissioned in 1931, De Garis became head of the unit. In those years, there were high maternal and infant death rates. Her record of 1,000 deliveries completed by 1938 without the loss of a mother was outstanding. During the Depression she improved the health of mothers and infants by promoting improved diets. Some of her interventions for pregnant women were revolutionary at the time and later became accepted practice. In 1954, the Geelong Hospital named a house in the hospital grounds De Garis House. Kept detailed records of 2,000 deliveries. Presented regularly at British Medical Association conferences. Authored many Letters to Editors about social and economic issues. Her life was not easy, but she practiced until she was 79. She was well-known in Geelong and Melbourne and had many grateful female patients. De Garis died in 1963 in Geelong, aged 81. Ruth Lee has given many presentations on the life and times of Mary De Garis. in the menu at the top of the page, click on “NEWS“. Dr Ruth Lee’s writing about De Garis is on other sites and in newspaper articles. The Publisher’s Site: Buy the book here. We were delighted to host you and to witness the tremendous interest that your talk and film showing generated – as evidenced by the number of bookings for this event. Public interest in world War One is very obvious as we move through the centenary commemorative period. As we have explored our collections we have been very taken by some of the less visible characters and stories represented by the objects collected from that period. Not least important of these is the role of the many people who undertook voluntary and ancillary service in order to support those in active service. Women, often less celebrated for their contributions at times of conflict and peace-making, were, we have discovered, essential. And this is what your painstaking and thorough research illuminates. Not only have you brought back to us the stories of women who are under-researched and little known about in their home counties, but also your lively presentation and enthusiasm brings our hearts and minds out to areas of the conflict that are also too often forgotten. Thank you so much for all you are doing to augment our understanding of the Great War and the personalities involved and also for taking the time to present these stories in such an engaging and informative media.